Yah, mine took 9 - 10 years before it puped out its first fruit. Although, I surely could have gotten it to fruit sooner had I paid more attention to it. Currently out of town, but will snap some pics when I return. My experience while keeping up with the thread headline. I gave up on it. Slower than mangosteen, stays tiny forever it seems. Every few months gets completely overwhelmed by other vegetation. In my case not worth the effort, but maybe different story for someone planting in well maintained lawn. Got seeds directly from Luc in June of 2015. Seeing the first flowers on the tree today (2/11/19)-- so just under 4 years. 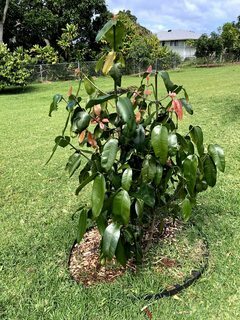 Tree planted in full sun here on the North Shore of Oahu with irrigation when it gets dry. I actually planted two trees in one hole but only see flowers on one of them for now. Somehow the flowers managed to stay on despite the 50-60 mph winds we had here yesterday. Got a little over a dozen fruits on mine. 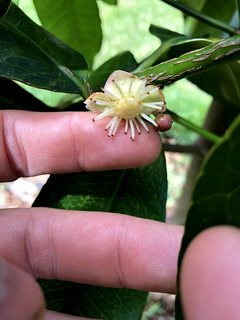 It flowers non-stop, there are small fruits and flowers on the tree currently in addition to the big ones shown below. How big do these things get? Looks great, congrats! Juding from photo that Luc posted comparing it to achachairu, the Mexican fruit can get quite big. Almost the size of a tennis ball. Thanks! Tennis ball sized? Yikes! I decided to up-pot my lucs grafted onto lemon drop today. It hadn't done much in the past several months. I think I know why now. The tap root had wound round the bottom of the pot one full circle and was well on its way to complete a second trip around. I wasn't sure what to do though I know I couldn't keep the tap root the way it was. I didn't know if trying to straighten it out would work. I too most of it off and re-potted in a slightly larger pot. I will keep a close eye on it and will try to get it in the ground within the next month or so. I understand from posts by others that they like shade, at least while young, but since it is going into its permanent home (if it lives) should I put it in full sun and make some share for it until it establishes? any suggestions on what to do to give this plant a chance is welcome. Looks like you've already cut the circling tap root off the plant? Obviously was in that pot too long. I would put it into the ground after trimming tap root, and put a shade cloth over it until it adapts to outdoors. I just have my daughter paint the Microkote on the insides of all my pots (she receives payment in full). That stuff works wonders. 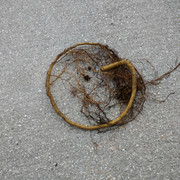 ZERO root circling. Everything I've either up-potted or planted has taken off like gangbusters. I will fall on my sword in regards to Luc's Garcinia...Nothing I've tried, has worked to speed things along. Yes, I cut it off. I am thinking that when I do put it in the ground I will plant a seed or seedling with its tap root intact next to it in the save hole and approach graft them later, perhaps a second root system will help. Has anyone done this? Nah ur good..i root pruned this thrice and still growing fine on a 5 gal. Do the leaves look different? Do the fruits look different? Do you specify which you'd like to Raul when ordering or something? Here is mine currently. No fruit or flowers. Thanks for the clarification, Raul. Will be happy to see u post photos of the lucs species once u go there.